Geneva-based PrivatAir has placed a firm order for five Bombardier CS100 airliners and has taken options on an additional five of the type. Based on the list price for the Bombardier CS100, the manufacturer values the firm order at approximately US$309 million, which could increase to US$636 million if PrivatAir exercises its five options. PrivatAir was founded more than 30 years ago and operates a large fleet of commercial and business aircraft to provide private charter and private airline services. Its specialized services include exclusively business-class flights on behalf of several major network airlines. Bombardier Aerospace says the Bombardier CS100s acquired by PrivatAir will be delivered in an all-business class configuration, demonstrating the versatility of the all-new Bombardier CSeries family. “Included among the 11 customers that have selected the CSeries aircraft are major network carriers, national carriers, premium airlines serving city-center airports, a low-cost airline, leasing companies and now, with the order from PrivatAir announced today, a full-service provider to airline partners,” notes Philippe Poutissou, vice president of marketing for Bombardier Commercial Aircraft. “This diversity of customers speaks volumes about the flexibility of the CSeries aircraft family to meet air transport requirements worldwide,” adds Poutissou. 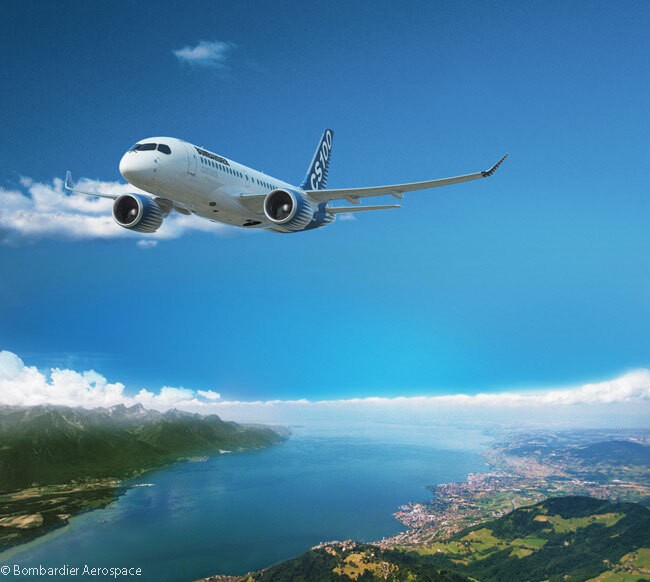 Designed for the growing 100-to-149-seat market, the all-new CSeries family of aircraft combines advanced materials, new technology and proven methods to meet commercial airline requirements in 2013 and beyond. Powered by Pratt & Whitney PurePower PW1500G engines, the CSeries aircraft family will offer a 15 per cent cash operating cost advantage and a 20 per cent fuel burn advantage over existing jets of comparable size, according to Bombardier. 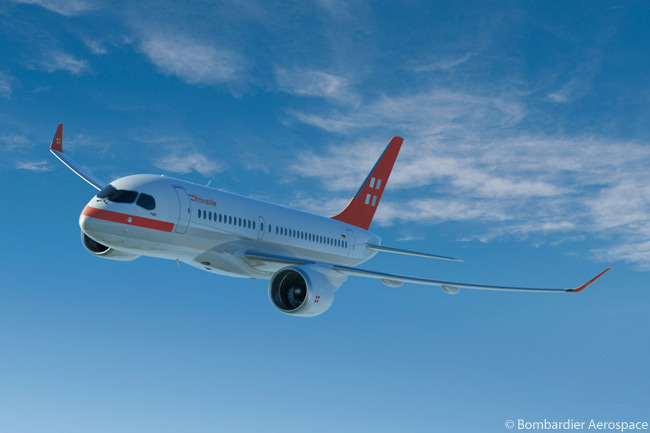 The manufacturer says the CSeries family’s clean-sheet design will enable the aircraft to achieve greatly reduced noise and emissions, as well as superior operational flexibility, exceptional airfield performance and a range of 2,950 nautical miles (5,463 kilometers). Bombardier aslo says CSeries aircraft will be up to 12,000lb (5,443kg) lighter than other aircraft in the same seat category and will provide passengers with a best-in-class, wide cabin environment in a single-aisle aircraft. Including the order from PrivatAir announced on January 19, Bombardier has booked firm orders for 138 CSeries airliners. Other customers include Republic Airways (40 CS300s), Deutsche Lufthansa AG (30 CS100s), Lease Corporation International Group (17 CS300s and three CS100s), Korean Air (10 CS300s), Braathens Aviation (five CS100s and five CS300s), an unidentified major network carrier (10 CS100s), an unidentified European customer (10 CS100s) and a well-established, unidentified airline (three CS100s). The CSeries aircraft program has also booked options for 124 aircraft and purchase rights for 10 aircraft from these customers, as well as letters of intent for up to 30 aircraft from Ilyushin Finance Co, and for up to 15 CS300s from Atlasjet.